Hi, I am interested in your 1979 Chevrolet Camaro (stock #1232-NSH) listed on Autotrader for $15,995. I'd like to get more information about this vehicle and confirm its availability. These second-generation Camaros are great driving cars. They have a wide track and low center of gravity that makes them hug the curves and accelerate out of corners with the push of V8 power. But they are also comfortable with things like air conditioning and nice sound systems that make road tripping in them enjoyable. This one remains completely stock and has been well cared for, so come on down and check out how nice this car really is. Its hard to believe that this car is 30 years old! The styling still looks good with an aggressive stance and smooth, clean, lines. The paint, which is the original color of Silver still looks great today, so you know this car was somebodys pride and joy for all those years. Up front, the black grill is split by the molded bumper with a deep chin spoiler that wraps around the side pushing the air out beyond the wheels. Z28 appears on the nose with the headlights and markers set into blacked out fairings in the bodywork. There is an air induction scoop outlined in Orange striping on the hood and side vents on the fenders. A two-tone orange stripe runs along the rockers with Z28 in black and a serious rear spoiler keeps downforce on the back end at speed. Another set of orange stripes with Z28 lettering runs just below the spoiler with the taillights and a clean molded bumper below that. Open the door and you will find a very clean and well taken care of Black interior. The door panels have a comfortable armrest in a vertically molded center section with a smooth upper and lower. The high back bucket seats are super comfortable with pleated seating surfaces divided into sections and smooth side bolsters that provide great support for spirited driving. Between the seats there is a center console that has some nice storage with a lid that doubles as a nice armrest on long cruises and just in front of it is the shifter for the automatic transmission. There is a four-spoke steering wheel with a Z28 horn button mounted on a tilt column with a stock dash and gauges that includes a factory tach behind it. The ventilation controls which include air conditioning are low on the left side and there is an AM/FM/CD player for your listening pleasure. Pop the hood and you will find a tried and true 350 cubic inch V8 motor nestled down in the engine bay. It is completely stock with signs of good regular maintenance just as you would expect based on the condition of the rest of the car. The belts and hoses as well as the ignition items like plugs, wires, and distributor cap are all newer and the AC lines to the compressor have recently been replaced too. Power flows back through a 3-speed automatic transmission to the rear wheels through a 10-bolt rear end mounted on leaf springs. The front end is a control arm setup with coil springs and the spring rates as well as sway bars both front and rear were matched by the factory to provide the kind of handling you expect from a Z28. Power front disc brakes insure that you can haul this car back down from speed if you let the horses run and the rubber meets the road through 225/70R15 Cooper Cobra tires mounted on 5-lug alloy wheels. 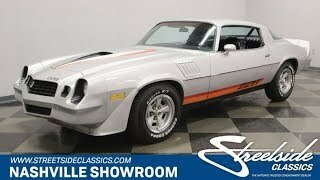 This is a really great example of a second gen Z28. It was somebodys pride and joy and was well taken care of. Come on down and check it out. You might decide to become its next caretaker.